The 2nd annual OFF THE HOOK Seafood Festival hits the Santa Monica Pier on Saturday, Oct. 1 in honor of National Seafood Month. 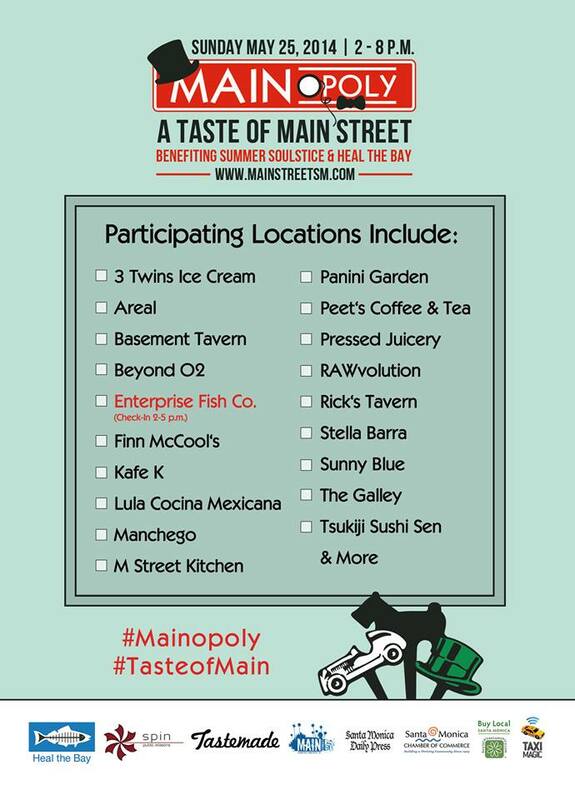 This community fundraising event showcases the city's best restaurants and chefs with dishes featuring their favorite underwater ingredients such as oysters, shrimp, sushi, fish and tuna. Attendees will enjoy food and drink tastings, beer garden, live music, games, activities and more, and can also purchase a ticket to the Santa Monica Seafood Sustainable VIP Lounge, which includes tastings from select, sustainable restaurants, as well as cocktails and preferred seating in a designated area. OFF THE HOOK benefits theWestside Food Bank and raises awareness for the sustainable seafood movement through a partnership with Seafood for the Future. Grab your mates and get to The Anchor Venice this Saturday night for a free lobster roll as they celebrate their two-year anniversary. 100 of their signature truffle-topped lobster rolls will be given away to the first people at the party starting at 6 p.m. Live music and drinks specials continue through the night, and for those who've missed The Anchor's s'mores panna cotta dessert, it's back on the menu for the special occasion. Wallflower Venice, a relative newcomer to the Rose Ave. dining scene, and one of the best spots in town for a modern twist on Southeast Asian flavors (and cocktails), recently added brunch to its repertoire. The menu moves from American staples like egg sandwiches and biscuits with jam to savory dishes including Chinese barbecue pork belly and chicken satay. There's also a rotating selection of artwork on display in the rustic-modern dining room interiors designed by Dustin Miles (Venice Beach Wines). And starting Sunday, July 31, Tim Roller's work will be on display, mixed-media pieces that utilize a variety of materials, from wood and glass tile, to crystals and rope. The show is presented by Tessellate, which creates multi-sensory experiences of music and art. To commence Roller's month-long residency, Wallflower Venice is hosting a special brunch with what they've described as dreamy daytime musical vibes from Ken Satellite. Whoa! Have we been filling up on these lobster rolls for a year already? Yes, yes we have. And we'll continue to do so as The Anchor turns 1 and invites everyone to enjoy its signature black truffle topped lobster roll with a drink of choice for $11 next Saturday, August 29. Start the celebration early at 11 a.m. with The Anchor's bottomless brunch ($14) or join in for happy hour at 3 p.m. and stake out a cozy corner to settle in for the evening's festivities. dineL.A. 's Restaurant Week, January 19 - February 1, 2015, is actually a two-week dining event showcasing restaurants from Alhambra to Long Beach with specially priced prix-fixe lunch and dinner menus. Search by neighborhood to find deals on here on the Westside. Oakwood Park launches a summer series of evening Sunday funday activities starting June 8. From food trucks to movie night in the park, parents and Oakwood's advisory board members are working together to create more family-friendly gatherings at the community park and recreation center. Oakwood's Food Truck Sundays will happen every Sunday through August 2nd, and run from 4 to 8pm. 10 percent of the proceeds from selected food trucks will go towards park improvements.